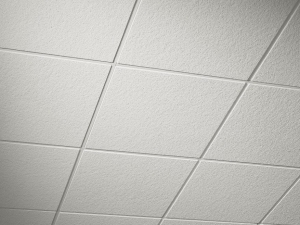 Ceiling tiles tend to improve the acoustics of a room. They provide effective sound control when attached directly to a ceiling or used as a drop ceiling. 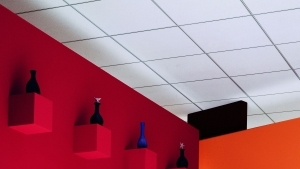 With many different designs, materials, and sizes available, acoustic ceiling tiles are a smart method for improving the acoustical qualities of any room, thereby maintaining the comfort of its occupants. 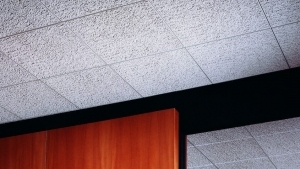 We offer a wide selection of acoustical ceiling tiles and grid for both commercial and residential applications. High NRC & CAC, and fire ratings are available to fit the needs and scope of your project. Specialty ceilings are also available by request. 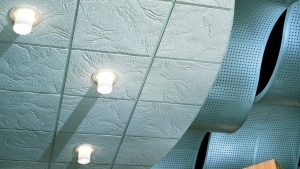 Below are some of the acoustic ceiling tiles that we offer. Call today to speak to one of our ceiling tile specialists and learn what makes the most sense for your specific space and goals. With micro-perforations that provide for a smoother look and better sound absorption, these panels offer an upscale appearance at a mid-range price. Olympia™ Micro™ Acoustical Panels offer high-level light reflectance, mold and mildew resistance, ceiling attenuation and noise absorption, making them the perfect choice for classrooms, hotels, reception areas and lobbies, restaurants and retail stores. Designed with an excellent resistance to mold and mildew, these medium-textured panels offer a clean, fresh look. Radar™ Acoustical Ceiling Panels contain a proprietary broad-spectrum standard formulation that inhibits the growth of mold and mildew. With a non-directional, medium-textured pattern, these sag-resistant panels are an optimal choice for use in schools, corridors, lobbies, offices and retail stores. 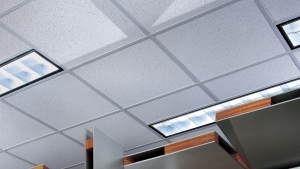 Exceptional durability, great noise reduction and a unique, heavy texture make these panels an optimal, long-lasting ceiling solution. Glacier™ Basic Acoustical Ceiling Panels are made with a special cast process that enhances their appearance and grants them excellent sound control and durability. Offering great noise reduction, these scratch-resistant, easy-to-clean panels are ideal for food courts, hospitality environments, libraries and restaurants. They are also available in FireCode. Providing light reflectance and sound control, these high-performance panels offer sag-resistance, durability, and versatility for many different environments. 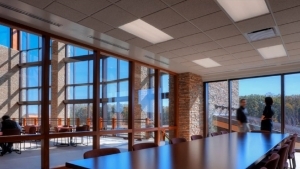 From sound and moisture control to high levels of recycled content and zero emissions, Frost™ Acoustical Ceiling Panels are perfect for the wide-range of needs often faced by architects and designers. These fine-textured, cast acoustical panels resist sagging and feature an excellent combination of noise reduction and light reflectance. They are perfect for conference areas, lobbies, executive offices, open office plans, boutiques and educational environments. Exceptionally durable, with superior sound control and sag-resistance, these uniquely medium-textured panels are an artful custom ceiling option. Each Sandrift™ Acoustical Ceiling Panel is made with a cast process that enhances its appearance and gives it excellent sound absorption and durability. 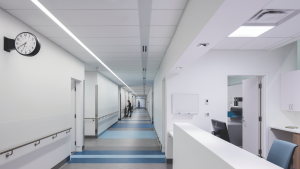 Their resistance to mildew and mold, and high noise-reduction qualities, make them a high-quality, versatile choice for a variety of ceiling projects. Offering a combination of sustainable aesthetics and outstanding performance, these panels are specially manufactured to maximize sound-control and anti-sag performance. Mars™ Acoustical Panels are fine-textured, mold-resistant and offer superior sag-resistance, high light reflectance values and excellent noise-reduction. Their durability, performance, easiness to clean and attractive appearance make them an ideal choice for corridors, department stores, reception areas, lobbies and general office spaces. Donn® Brand Centricitee™ DXT™/DXLT™ Acoustical Suspension System was specially designed to maintain the appearance and integrity of your ceiling’s paneling. This system allows for the use of standard square-edge panels, and will help the paneling to hold its position without sagging or twisting.